If you are looking to take your business mobile or create a new solution to a problem, we are here to help by delivering a meaningful, accessible digital product for you. We Bring Your App Ideas to Life! We build interactive mobile Apps, beautifully designed to engage users with your brand in an intuitive, fast and creative manner. Our unique, cutting-edge iOS, Android and Windows mobile apps are 4 times faster than other market competitors. 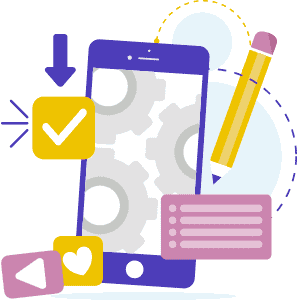 Our Cross-Platform Development tools for Hybrid App Development allow us to deliver Mobile App Development solutions to any mobile platform. Powerful Mobile App Development Features to Deliver Amazing Apps. We develop scalable and bespoke user interfaces for Android platforms. We build high quality iOS Apps to meet all your business objectives. We develop Mobile Apps that can be used on multiple mobile platforms. All our Mobile Apps are customised to meet the unique needs of your business. A Mobile User Interface design that is easy to understand and use. We ensure your app performs to peak performance regardless of device. Full control over your project, reducing risk & offering predictability. We stay connected throughout the project, maintaining transparency with you.